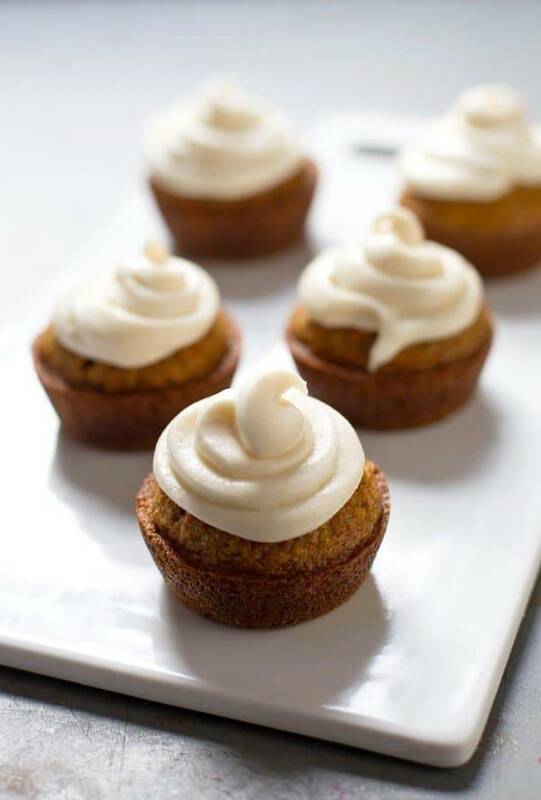 These carrot cake cupcakes? THE BEST. My sister is having a baby! And I am having a CUPCAKE! Ohhh yeah. Babies and cupcakes. Things are about to get awesome. I hosted a baby shower for my sister this last weekend because I like to try to defy reality by hosting baby showers in my small new house after moving in roughly ten days ago. Boxes shoved in closets, nothing on the walls, and people and presents and flowers galore. Lovely. Juuust lovely. Okay actually, it was lovely. And if I had one fraction of a thing to do with the cuteness of the baby shower, it was my contribution of carrot cake cupcakes. Which are life-changingly, hate to say it, but, moist, and will forever be a part of my baby shower recipe repertoire. Remember Ang’s shower years ago? Same cupcakes. Same deliciousness. Same cream cheese frosting in my hair for weeks. In the next few days I’ll share some pics from the real shower including of my sister’s baby boy belly which will probably melt your face off. Is that exploitative? Please friends, come back to see pictures of my sister’s adorable (clothed) belly. Not weird at all. Mmmhm. For today, you get this recipe, which is basically the whole reason I hosted the shower. I mean, babies are cute and everything, but CUPCAKES. These are the best carrot cake cupcakes I’ve ever had! With a cream cheese frosting, of course. Perfect for dessert or brunch! Preheat the oven to 350 degrees. Combine the flour, sugar, cinnamon, baking soda, baking powder, and salt in a large bowl. 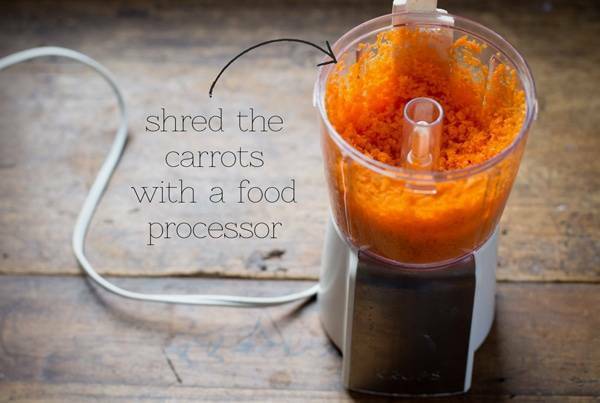 In a separate bowl, combine the grated carrots and the oil. Slowly add the flour mixture, stirring until just mixed. Add the beaten eggs and stir a few times (like 15 or less around the bowl – the fewer the better)! Grease a muffin tin or use paper liners. Scoop the batter into a muffin tin, filling each muffin tin about 2/3 of the way up the side. Bake for 13 minutes, check how they’re doing, and add a few minutes if necessary. I find that the baking time varies greatly with oven, so just check for the right golden brown color and springy tops. Allow the cupcakes to cool. These cupcakes are perfect. Carrot cake, cream cheese icing… I’ll have 10 thanks! Ha! Taylor you are too funny. Aaand I totally get you. My sister also just had a baby! I finding that I am now living my cake creations dream though my little niece. So cute and they look delicious, who does not like carrot cake? Happy almost baby day to your sister. It is going to be a fun journey. I love cakes with carrots in them but I have never perfected the cream cheese frosting so this would be good one to try. For those who don’t like really sweet frosting, I made these with 1/3 the recommended amount of powdered sugar and they were amazing. Usually the frosting ruins cakes and cupcakes for me and the mild frosting I made added a level of creamy, hint-of-savory- to offset the sweetness of the cake. Wonderful recipe and thanks for sharing. I made these a million and one times too, I couldn’t get them just right and I was even working off an old recipe! 🙂 but they’re finally there. Carrot cake is da bomb. These look perfect! Cream cheese frosting is the best of all frostings, isn’t it?! Delicious! And sounds like such a fun shower – you are a great sister! I was thinking the same thing! I love cream cheese frosting and carrot cake was always my favorite cake for my birthdays growing up! I am definitely going to make these for an upcoming meeting happening at a Coffee Emporium in Cincinnati with lots of new friends I met online. Thank you, Lindsay! And congrats on being an Aunt! Hope you like them, James! Congrats! My brother and his wife had their son a year ago so I have definitely enjoyed having a little one to celebrate. Last weekend, they had their 1st birthday and I helped by making the party favors for all the kids: animal sunglasses, animal face masks, and inflatable animal beach balls. Everyone loved them! How fun Quyen! Too cute. These look amazing. Can’t wait to try making them over the holidays! I’m kind of loving no cupcake liners for these! So much prettier and rustic, plus no picking up cupcake wrappers left all over your house when the party is over. Can’t wait to try these! Carrot cake is one of my favorite, so seeing them in cupcake form is making me hungry! Sorry to say but my perfect carrot cake has to include pineapple and nuts…. raisins are negotiable… but they sure look yummy! I just had carrot cake today…I’ve declared it my official favourite dessert of the year! These look so delicious. Congratulations on the baby coming into your family! That’s so sweet of you to host a baby shower for your sister! And to bake amazing cupcakes. With how much you enjoy spoiling people with delicious food, your little nephew is going to think you’re the greatest auntie in the world! I can’t wait to see your photos from the party; I’m sure everything turned out even prettier than the inspiration board! these sound and look amazing. what kind of oil do you use? vegetable oil? This recipe looks very similar to my all time favorite carrot cake recipe. And you know what I like to do to turn it up a notch? I add a little lemon zest to the cream cheese frosting and then sprinkle some toasted coconut on top. Is it just me or is everything in life better with coconut?? These look fantastic! congrats to your sister! My favorite dessert ever and I DO like lots of cream cheese frosting! Thanks Amy! I’m pretty exciteeed. Carrot cake is the perfect thing for baby showers. I do not know why, but it just is. And these are gorgeous!! Your cupcakes are so pretty! Carrot cakes is one of my favorite “american” (hope its American) cake. You are indeed a very brave woman! You seem to have taken the entire move in stride though, and have a baby shower under your belt to prove it! These cupcakes look delicious! 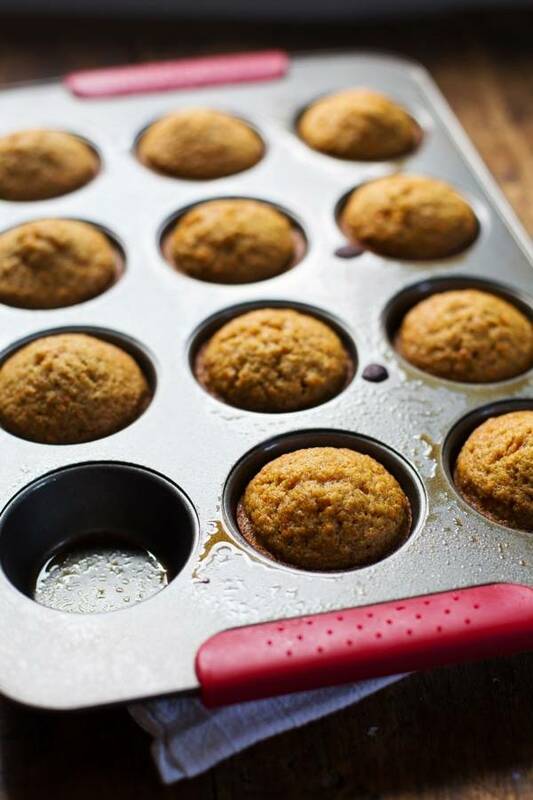 Looks like you used a mini muffin pan — perfect size! I think I will make these this weekend and freeze them. They will be great to serve during the holidays! The cupcakes look awesome! By 2 eggs beaten, u mean just beaten until yolks n whites r combined or beaten till it becomes frothy? Yes, until yolks and whites are combined. Just made these…and am now devouring them. Amazing. Adding to my recipe book. I attempted to make the frosting look pretty like yours, but sadly in the end I resorted to blobs of frosting. Still good though! These look delicious! I agree with you when it comes to cream cheese frosting, the more the merrier!